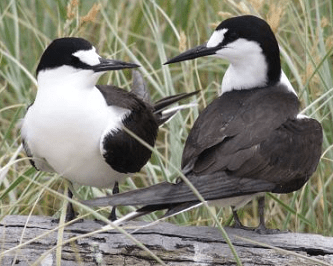 Size of adult sooty tern is between 33 to 45 cm including the tail. The weight of adult is between 150 to 240 g. They have a wingspan of 80 cm. to 95 cm. The breeding grounds are on oceanic islands, and barrier islands of sand, rock or coral. Outside the breeding season they stay well offshore and are rarely seen. The head is dark black and the face is white. The white forehead patch terminates just above the eye. 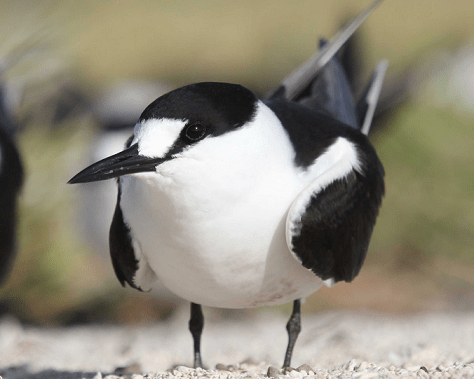 The bill of sooty tern is long, slim, and strong, and black in color. Legs are strong and black in color. The black tail is deeply forked and shows white outer rectrices. Tail is markedly forked with long outer tail feathers forming streamers. The adult in non-breeding plumage has variable amount of white-edged feathers on the upper parts. The black crown is slightly and finely mottled………. Sooty tern is a beautiful bird. Size of adult sooty tern is between 33 to 45 cm including the tail. The weight of adult is between 150 to 240 g. They have a wingspan of 80 cm. to 95 cm. Adult Sooty tern has blackish crown and hind neck, and upper parts. The underparts are white with blackish flight feathers. Eyes are dark brown in color. There is a black line from bill to eye. The head is dark black and the face is white. The white forehead patch terminates just above the eye. 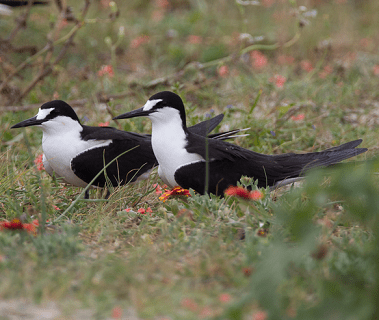 The bill of sooty tern is long, slim, and strong, and black in color. Legs are strong and black in color. The black tail is deeply forked and shows white outer rectrices. Tail is markedly forked with long outer tail feathers forming streamers. The adult in non-breeding plumage has variable amount of white-edged feathers on the upper parts. The black crown is slightly and finely mottled white. 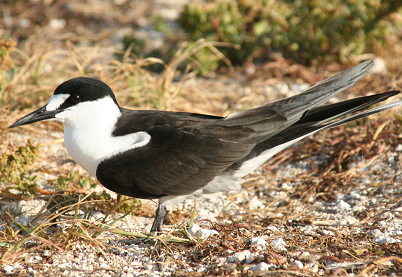 Both sexes are similar, but young Sooty Tern are blackish-brown above and below, except on the whitish vent. The throat and breast are also dark, grading into a paler belly and under tail, and the under wings are pale grey. They occurs in tropical and subtropical areas of Americas, Africa, Asia and Australia. 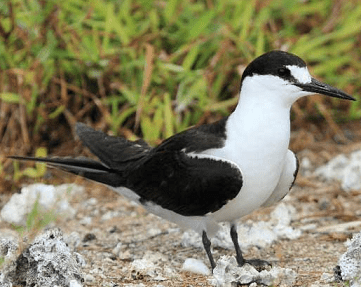 The Sooty Tern breeds on tropical islands and ranges through most of the tropical oceans. Outside the breeding season they stay well offshore and are rarely seen. They prefer tropical oceans, and some sub-tropical regions. The breeding grounds are on oceanic islands, and barrier islands of sand, rock or coral. Outside the breeding season they stay well offshore and are rarely seen. The Sooty Tern occurs in flat and open, and often heavily vegetated. The flight is swift, buoyant, and graceful. Sooty Tern is a social bird. They found in large groups. Sooty Tern is a noisy bird. The call is a loud piercing ker-wack-a-wack or kvaark or kraark…. kraark or wide-a-wake. They feed on fish, squid, crustaceans, insects, and offal. They feeds by using several techniques such as aerial-dipping, skimming over water or contact-dipping, and rarely plunge-diving. They also feeds at night, taking fish coming to the surface in darkness. The breeding season can be annual or seasonal according to the place. They breed in huge colonies. The nests are very close to each other. The age of sexual maturity is between 5 to 7 years. 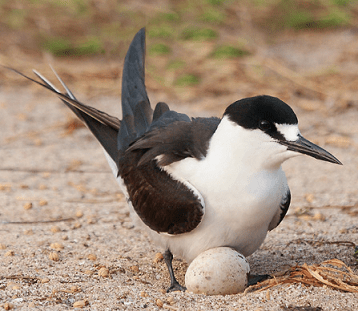 The Sooty Tern nests in large or huge colonies on ground, usually in open, sometimes under edge of shrubs. Eggs 1-2, Whitish, variably marked with brown, lavender, gray, sometimes black. Incubation period is between 28 to 30 days, shared by both parents. The young fledge at two months. The average lifespan of Sooty Tern is between 26 to 32 years.